During the last couple of weeks, whilst our caseload has been varied, we have seen several cases of behavioural regression in children of all ages (even teenagers) which have been related to a new baby whether impending or recently arrived. Most children whilst helpful and excited on the one hand, also find this a confusing time. Any parent knows what a huge change a new baby is for the whole family and many children feel some form of anxiety as their place in the family shifts. Whilst this can be subconscious rather than malicious, the behaviour changes that parents notice can range from acting out to toilet training regression and to disruptive behaviour at school. BEFORE BABY ARRIVES: Whilst it is important to let your children know about the pregnancy and that there is a new sibling on the way, children particularly toddlers are not good with time and so may not be able to grasp the concept that the baby is coming in a few months. It can be helpful to frame the time with reference to an event that they know eg: a holiday or birthday. Preparing your children in a practical way for what is coming can also help to alleviate some fears. If possible, arrange for them to spend time around babies so they understand the positive and negative realities of them. It can also be helpful to spend time during the pregnancy to allow them to build relationships with other family members or close friends. This helps to work on their ability to bond and form attachments and will hopefully assist in them being able to do so with the baby. If you are comfortable with it, encourage your children to touch and feel the baby so it becomes real in their minds. The most important thing however, is to reassure your children that although they feel that everything is changing, you are still mummy or daddy and that will never change. They will always be special, valued and important and you will love them just as much. 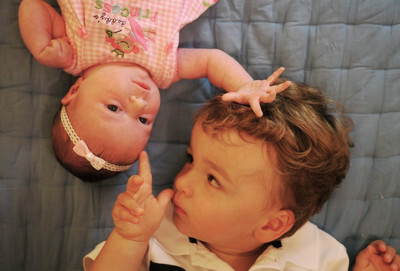 ONCE BABY IS HERE: The first few days with a new baby are overwhelming not only for you but for your children as well. Purely the fact that mummy will have been in hospital and away from them possibly for the first time is unsettling in itself for children of any age. The sooner they are able to see mummy and meet the baby for the first time, the less they are able to imagine what might be happening! It is a nice idea to have your children bring a present to the baby on their first visit and to have a present ready from the baby for them. This helps them to build a relationship based on something tangible rather than just feelings that may or may not be there immediately. It is important to let your children lead how involved they want to be with helping with the baby eg: nappy changes and bathing. If they are curious and want to help, it should be encouraged, but if they are happy to play or do homework while you are with the baby, that is ok as well. Either way, praise for your children and how they are helping even if the help is being quiet when the baby sleeps is crucial in the first few days, weeks and months. More than anything, your children want to know that not everything has changed. One way to show this is to have definite routines from before the baby is born that are continued after the baby arrives. One example of this might be sitting down to dinner as a family and allowing everyone to talk to each other without the baby present. Your children will also miss the dynamic that was and having to share you with another person. Therefore, finding time every day or at least a couple of times a week for 1 to 1 time, even just a bedtime story before bed can provide some of the comfort and reassurance that your child is seeking. It is important to remember that all change and transitions are hard for everyone involved and children pick up on the same anxieties as adults, it just may be expressed differently. A new dynamic will form and a new normal will emerge and as a family you will adapt accordingly.